It's been a fun existence, but someone tripped over a coolant cord in the core and the planet you've called home for eons is going to explode. Looks like you are going to have to use your wits and every means at your disposal to escape! 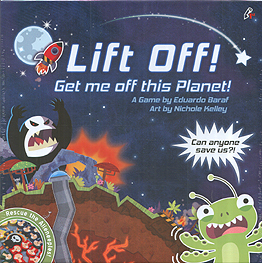 Be the first to get your Aliens off the planet using Resource Cards, Action Cards, and thePhases of the Moon to escape!